Unilever (NYSE: UL) is reportedly planning to buy GlaxoSmithKline’s nutrition business, which notably includes the Horlicks beverage brand. While the details of this deal are still unknown, Horlicks and GSK’s other nutrition products together could fetch at least $4 billion from Unilever. Horlicks has a presence across Bangladesh, Sri Lanka, Nigeria, Malaysia, and India, with around 85% of its revenues coming from the Indian market. Horlicks controls around half of India’s health food drink market. Consequently, there is a possibility that Unilever’s Indian subsidiary, Hindustan Unilever Ltd (HUL), would absorb the brand going forward if it takes place. Our $58 price estimate for Unilever’s stock is slightly ahead of the current market price. We have created an interactive dashboard on How Important Is The Foods Division To Unilever, which outlines our forecasts for the company. In this dashboard, we have summarized the key sources of revenues for Unilever. Horlicks is marketed as a health food drink enriched with nutritional supplements in India. However, sugar constitutes about one-fifth of its total ingredients, which is a concern given its reputation as a healthy brand as well as changing consumer preferences. Many consumers in the Indian market are shifting to newer and healthier alternatives to avoid high-sugar beverages. To add to that, the growth of malt-based beverages in India has also slowed down from 13.2% in 2013 to 8.6% in 2017. Further, the growth rate of supplemental nutrition drinks fell from 21.3% to 11.5% during the same period. Although the growth of Horlicks has slowed in recent years, Unilever could scale up the brand with its direct distribution channels. With the acquisition, Unilever could grow its Foods Business In India and other emerging markets – though it may have to rebrand the product as something other than a health and nutrition product. Food is the second largest contributor to Unilever’s revenues. In 2017, the segment’s revenues grew slightly to $14.1 billion, its EBITDA margin stood at around 22%, and it accounted for almost 20% of the company’s total valuation, per our estimates. 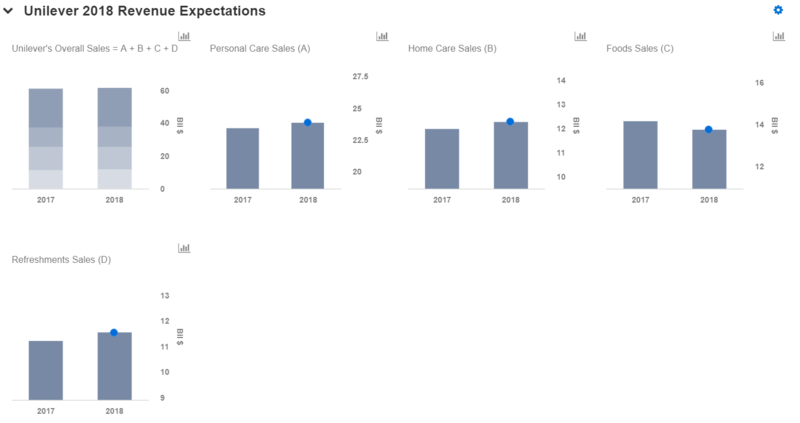 The company’s priority has been shifting from Foods to the Personal Care division of late, as evidenced by the fact that the revenue share of its Foods unit has fallen from 30% in 2011 to 23% in 2017, while the share of its Personal Care segment has grown from 33% to 39% over the same period. A major reason for this shift was that the company was not able to generate significant growth from the spreads business, which resulted in its divestiture to KKR. Unilever’s Food division’s contribution to the company’s total EBITDA has also declined significantly, from 41% in 2010 to 22% in 2017. However, we expect the company to recover from the sharp decline due to its focus on cost-saving programs, and the divestiture of its spreads business. Going forward, we estimate the EBITDA margin of Unilever’s Food segment to improve to 23% by the end of 2022. We have assumed that inorganic growth will proceed gradually, in line with Unilever’s acquisition strategy in the segment.